If you’re reading this, you’ve likely bought a box of wraps or a single applicator. For that, I congratulate you! You are on the greatest path to feeling and looking great! So, are you ready to dive in?! The Body Wraps are very easy to use! Simply remove an applicator from the package and apply to clean skin. Use saran wrap or a tight garment to keep it in place for 45 minutes. After 45 minutes you can remove it and throw it away. The directions are on the package and you can also check out my tips and tricks for the best practices! You can apply the applicator to your legs, arms, buttocks, chin, tummy, back and breasts. We recommend taking before pictures so you can track your results. The most important part of this treatment is hydration! We recommend drinking half of your body weight in ounces of water for three days. So if you weigh 150lbs, drink 75 ounces of water each day. The It Works Body Wraps are recommended for adults, not children. Our products are safe and effective, however, the company doesn’t recommend that pregnant or nursing women use the Body Wraps. Many nursing mothers print the ingredient list off and take it to their doctor and get an okay from them. Read ALL about the body wraps here! As long as you continue to live a healthy lifestyle, your results with the wraps can remain permanent. There are other types of body wraps that simply cause water loss — our body wraps don’t work this way. The It Works Body Wraps work to tone, tighten, and firm the skin in a way that produces lasting results, and it’s not water loss. You have to drink water to get results! If you were to diet/exercise and lose weight, then begin to eat and drink unhealthy, you will reverse the results. It’s the same for the wraps! If you achieved results with the It Works Body Wraps, then eat and drink unhealthy, you’ll reverse those results. Depending on your eating habits and lifestyle, typical results to last from 2 – 6 months. But, if you continue living a healthy lifestyle, your results can last! Using Defining Gel can help make sure that you improve and maintain your results from the Wraps. For best results, use the Defining Gel twice a day. Continued use of the It Works Body Wrap will also help you achieve continued results and maintain your results, as long as you continue to live a healthy lifestyle. 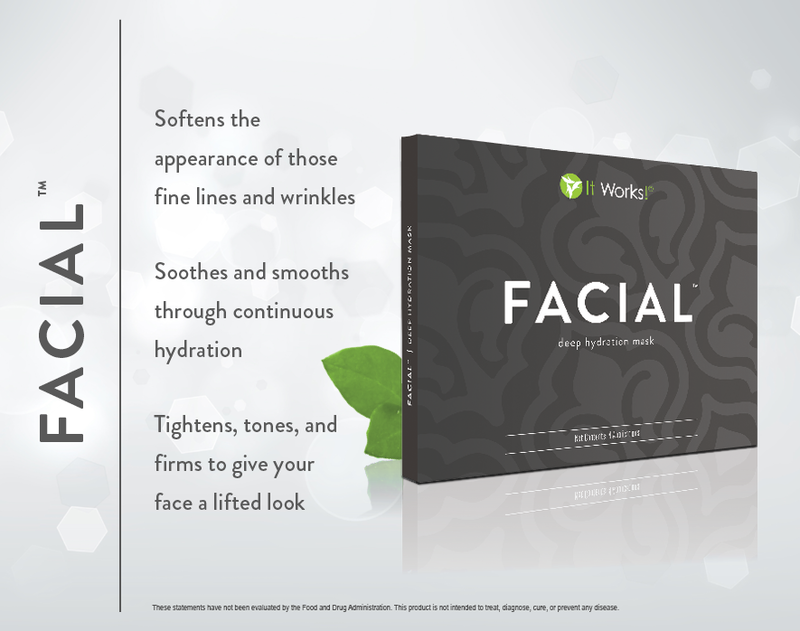 The Facial Applicator is contoured for your face and very easy to apply. Place the applicator directly onto your face and smooth out any wrinkles. No need to wrap this one! (You need to breathe, after all!) You will need to leave the applicator on for 45 minutes so it is best to lie down during this process. Once complete, simply discard the application and gently message in the excess cream for added benefits.